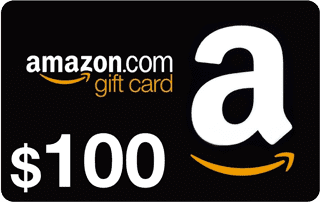 CONTEST: Win a $100 Amazon Gift Card! Congratulations to Alex Barton and his level pack "Pokemon Gen2!" It was a close race at the end there! Be sure to download Wordimals and keep an eye on the in-app announcements for the next upcoming contest. Make the best levels, win a shirt and gift card! Eligible to residents of the United States and Canada only. 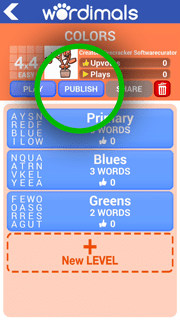 Wordimals is a new word search game for mobile phones and tablets. Uniquely, the game challenges you to bite-sized puzzles with a clue about which words to find, kind of like trivia night meets boggle. To celebrate the upcomming launch of the Wordimals Creator Update, we are holding a contest to find the best user-made levels! The most popular pack of levels at the end of the contest will win its creator a $100 Amazon gift card and a stylish Wordimals t-shirt. Tell your friends to go play the beta and upvote your puzzles! Contest ends at noon PDT on June 26th! Winners will be announced on this page, as well as on our Twitter and Facebook sites. 1) ELIGIBILITY - The Wordimals Creator Update Contest (the "Contest") is open to legal residents of the United States and Canada. Employees of Firecracker Software and their immediate families and household members are not eligible. The Contest is subject to federal, state, and local laws and regulations. 2) SPONSOR - The Contest is sponsored by Firecracker Software, located at 15407 E Mission Ave STE 202 in Spokane Valley, Washington, 99037. 3) AGREEMENT TO OFFICIAL RULES - Participation in the Contest constitutes entrant's unconditional agreement to these Official Rules and the final, binding decisions of the Sponsor. Compliance with these rules is necessary to win the prize. 4) CONTEST PERIOD - The Contest begins on JUNE 12, 2017 at Noon Pacific Daylight Time and ends on JUNE 26, 2017 at Noon (the "Contest Period"). Entries published after the Contest Period will be disqualified. Submissions will be accepted via the Wordimals app only. 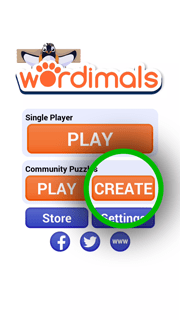 5) HOW TO ENTER - According to the directions at (http://www.wordimalsgame.com/contest), any player who publishes at least one level pack (an "Entry") is entered into the Contest. Players may submit multiple entries. All entries become the property of the Sponsor and will not be acknowledged. 6) WINNER SELECTION AND NOTIFICATION - According to the directions at (http://www.wordimalsgame.com/contest), the Entry with the highest number of upvotes at the closing of the contest is selected as the winner. The Sponsor will immediately attempt to contact the winner via e-mail. If the winner cannot be contacted within five (5) business days after the first contact attempt, the Sponsor may select the next runner-up from the remaining entries in place of the winner. In the event of a tie, a secondary factor chosen by the Sponsor will break the tie (for example, the Entry's publish date or quality). Entries that are considered inappropriate may be invalidated at the Sponsor's sole discretion. Prizes are considered forfeit in the event of noncommunication or the prize being undeliverable. 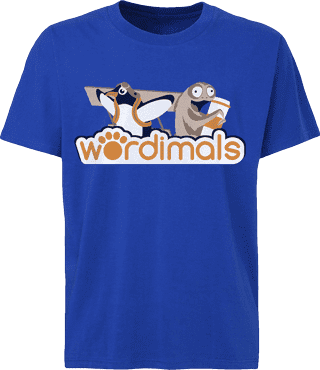 7) PRIZES - Grand Prize (1): $100 Amazon e-Gift Card (US or Canada) and a Wordimals graphic t-shirt. 8) GENERAL CONDITIONS - If the Contest is impaired in any way or becomes unable to be run as planned, the Sponsor may in its sole discretion suspend, resume, or terminate the Contest or award the Prize to the most eligible, non-suspect entry received up to the time of the contest's termination. The Sponsor reserves the right in its sole discretion to disqualify any Entry or individual it finds to be tampering with the entry process or the operation of the Contest, or to be in violation of these Official Rules. Any attempt to damage the game, this website, or the operation of the Contest may be in violation of criminal and civil law. The Sponsor reserves the right to seek damages (including attorney's fees) and any other remedies from any such individual to the fullest extent permitted by law. Failure by the Sponsor to enforce any provision of these Official Rules shall not constitute a waiver of that provision. 9) RELEASE AND LIMITATIONS OF LIABILITY - By participating in the Contest, entrants agree to release and hold harmless the Sponsor and their associates from and against any claim or cause of action arising out of participation in the Contest or from the receipt or use and misuse of the Prize. Entrant further agrees that the Released Parties' liability will be limited to the cost of entering the Contest, which is free, and in no event shall the entrant be entitled to receive attorney's fees. Entrant waives the right to claim any damages whatsoever. 10) DISPUTES - Entrants agree that all disputes shall be resolved individually, without resort to any form of class action, and exclusively by the appropriate court located in Washington. Likewise, Washington and its laws hold exclusive jurisdiction over disputes regarding this Contest.